Before I get into today’s post, I want to send out my thoughts to all those impacted by the siege in Sydney’s CBD yesterday. I had to switch off Twitter and the TV as it was all just getting out of control. The GOOD reporting lost in a sea of dodgy journalism and a public undercurrent of racism. The talented Emma from Emma Kate Creative (the designer and co-creator of Scatter Love cards) so beautifully and creatively summed up where our hearts should be in the graphic below. Ahh, the last evening of the year. It’s always fraught with so much anticipation, yes? So much pressure played out on one night of the year. If you have kids and don’t have a selfless babysitter on tap then the reality is a night in hoping that you’ll stay awake past the kids’ fireworks; if you have teenagers then you’ll most probably fall asleep sober and have an alarm set ready to do a pick-up; if you are free of all such handbrakes on a night out or you’re hosting one at home, then this post is for you. Good luck with the taxis! 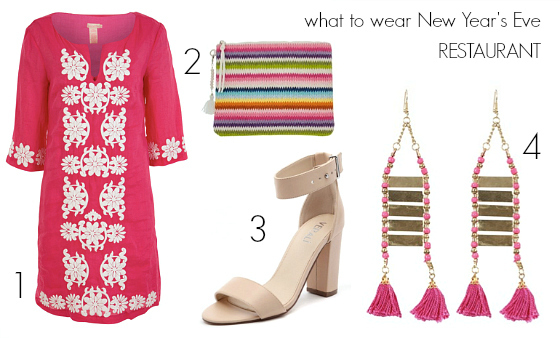 We’ve already tackled the First World issue of what to wear Christmas Day, now it’s on to New Year’s Eve. 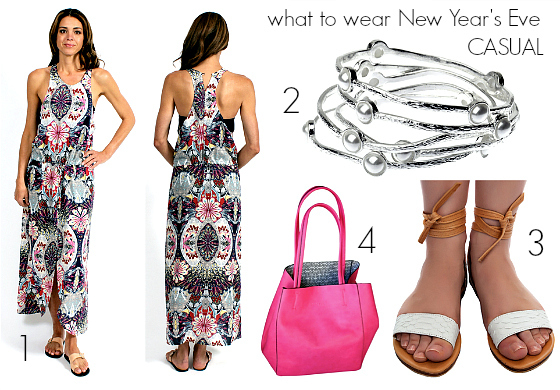 What to wear New Year’s Eve will of course depend on if and how you’re celebrating. Staying in and not seeing anyone, nothing wrong with some pyjamas, I say. Having friends over or heading out? Then think about the level of dress required and go from there. The below examples will also work for any party invite or gathering through the summer holidays. Use them as inspiration to shop from your own wardrobe or shopping ideas. It’s most probably going to be hot. You want to be comfortable but still feel put together. A frock – maxi or regular hem length – will work a treat. Keep is loose and flowy, team with strappy sandals and an accessory or two. Depending on the chosen restaurant, New Year’s Eve at a restaurant will often be one of those all-inclusive affairs. It may be cheap and cheerful or super fancy. With this outfit I’m erring somewhere in the middle and will let you ramp it up or down to suit the venue. If a night of glitz and a whole lot of glam is on the cards then think, “what would Nikki do” when deciding on the level of sparkle. This is not a night for holding back. Hey, I’ll probably be sparkling it up at home on the couch! You have permission to do the same. Tell me … do you have plans for New Year’s Eve? What kind of outfit is on your mind?